HTML Newsletter vs Newsletter in Plain Text - Which Format should I use? Newsletters, and other type of e-mails, can be sent in two different formats: HTML or plain text. Marketing and information professionals often face the question of which format to choose for their newsletter. There is no easy answer to this question, because both HTML format and plain text format have its advantages and disadvantages. Before making a decision, both formats should be carefully considered and compared. This article will describe some of the advantages and disadvantages of an HTML newsletter and a plain text newsletter. A newsletter created with HTML. Same newsletter in plain text. An e-mail newsletter created in HTML gives the advantage of using images, colors, different fonts, frames, enticing titles and sound effects. HTML also allows the use of hyperlinks that enable the readers to go to a specific Internet site to get more extensive information about a product or a service etc. Surveys show that newsletters created in HTML have more readers than newsletters created in plain text, which is not surprising as HTML offers great possibilities to optimize a newsletter. If you use the great advantages of HTML to design attractive and appealing newsletters, readers are more likely to take a closer look at the full content of your newsletter. Newsletters created in HTML also have the advantage of offering marketing professionals a measuring tool, where they can see how many people have actually read the newsletter and how many people have clicked on specific hyperlinks. An important advantage of e-mail newsletters created in HTML is that the graphical profile of the company can be reinforced by using the same images, colors, fonts, logotypes etc., that are used in the traditional marketing material. Articles in high-class, regular newsletters, containing interesting information for the reader, are read strikingly often. This in turn provides an excellent opportunity to graphically expose the reader, including those who only skim through the newsletter, to the company logo and trademarks during a relatively long period of time. An e-mail newsletter created in plain text can be perceived as boring by the reader. However, they have the big advantage of reaching the recipients more often and are always readable in the reader’s e-mail client. Newsletters created in HTML can sometimes be blocked by anti-spam filters, because the filter sometimes mistakenly recognises them as spam. HTML newsletters are also challenged with the disadvantage that they are not always readable in certain e-mail clients, and some users have also turned off the possibility to view images in e-mails. Moreover, some security software, such as Norton Internet Security, can sometimes prevent images from being displayed. It is possible to design an attractive and appealing newsletter that really makes the reader react and take action. 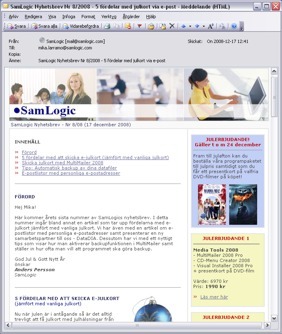 It is possible to design newsletters in conformity with the company’s graphical profile. The company’s logotype, for example, can always be displayed, and if the company uses certain colors and fonts in their traditional marketing materials, these can be reused in the e-mail as well. Newsletters created in HTML, with different fonts, colors, images, headlines, etc., are significantly more attractive which in turn generates more readers. The HTML format offer a possibility to measure how many newsletters have been read and how many recipients have clicked on specific hyperlinks in the letter. You can often also examine who has read the newsletter and who has clicked on the links. Anti-spam filters can block HTML newsletters and there are some companies that do not even accept e-mails in the HTML format. There are a lot of e-mail programs (e-mail clients) that can not read HTML-based e-mails, especially the viewing of images can be a problem for some. 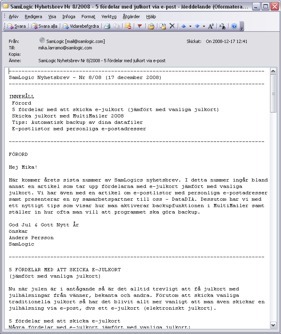 Furthermore, positioning of text and use of graphical frames in an e-mail can cause viewing difficulties in some e-mail programs. In case the user opens the newsletter in offline mode, and if the images are on a server on the Internet, the images will not be available for viewing. Someone at the company must have the knowledge and time to create HTML-based newsletters. Alternatively this can be outsourced, which in turn will generate increased costs. It is easier and less time-consuming to create newsletters that are plain text-based. All e-mail programs (e-mail clients) can read plain text-based newsletters. Anti-spam filters are more flexible towards, and more likely to allow, plain text-based e-mails. You can also reach users at companies that have network servers that block HTML-based e-mails. It takes less time to download a plain text-based e-mail message; the e-mail size is much smaller. This is a huge advantage for those who has a slow internet connection (e.g. a dial-up modem). A newsletter created in plain text can be more easily read in mobile phones (cell phones). For example the line width will be automatically adjusted after the display of the mobile phone. You can not create as appealing newsletter as with HTML. You can not use images, colors, different fonts, etc with plain text newsletters. And you can not create attractive headlines in the same way as in HTML, because the font size and font color is always the same. It is not possible to include clickable hyperlinks, and clickable hotspots, in an e-mail message. Some e-mail clients will automatically convert an Internet address to a clickable link, but this can not be guaranteed. There is no good way to measure how many actually read the newsletter. As you have read above, there are a lot of things to consider when making the decision whether to use HTML or plain text for your newsletter. You should ask yourself what your goal is and what you want to accomplish with your newsletter, and choose format thereafter. Alternatively, you can let the recipient choose the format. If you have the resources, and if it is contextually appropriate, you can also let the reader decide which format he/she prefers. The disadvantage is, of course, more work for you to do; you must enter same, or nearly same, text twice. This way you would, however, get more readers. One way to go about this method is to create a simplified plain text-based newsletter, containing the most important information, along with an Internet address (URL) and an invite to visit the web page for an HTML-based version of the newsletter.